As technology has advanced, computer-generated digital effects have only become cheaper, more realistic, and overall better—but filmmaking still has an overwhelming reliance on practical effects, which are done on set rather than on a computer. 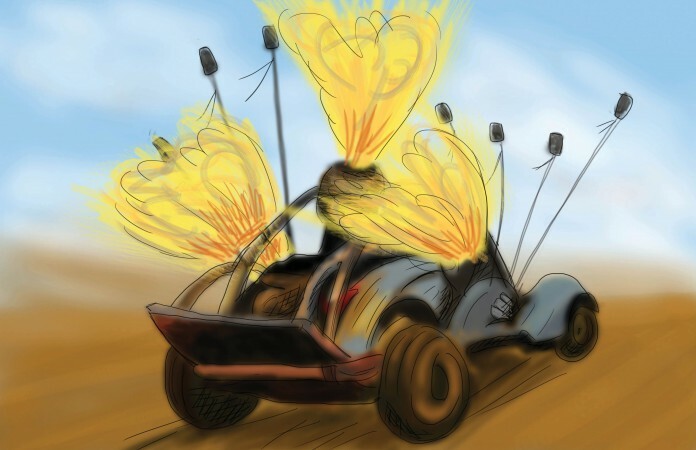 Last week’s smash hit Max Max: Fury Road was full of practical effects, car crashes, stunts, explosions and all. While it’s easier than ever to create entire worlds digitally, filmmakers are challenging themselves to instead create things in real time on set. There are a lot of scenes that most audiences don’t even recognize utilize digital effects—for example, Wolf of Wall Street relied heavily on digital effects to add people to empty stretches of beach, to seamlessly ‘copy and paste’ actors from one location to another, and so on. Interestingly, the same film used a real lion (admittedly, one that was green-screened in) to prowl around Stratton Oakmont. What is perhaps more impressive than digital effects that go unnoticed are practical effects that audiences might assume are digital. Intersellar built a ‘wormhole’ set to fly Mathew McConaughey around instead of creating those patterns on a computer screen, utilizing tricks of perspective as well as wall projections. 2001: A Space Odyssey similarly decided to build practical sets instead of trying a computer—director Stanely Kubrick utilized a rotating set, for example, to allow one of the characters to jog on a wall in a complete circle in one scene. The Penrose stairs in Inception were also done practically with a trick of the eye and some very clever camera work. The team at Thor: A Dark World built a giant hydraulic arm (which was, admittedly, later digitally removed) to levitate a cement truck when they could have done the entire thing with CGI. Utilizing CGI is all around easier, though—there are less safety regulations to be concerned about, less props to build, and less time working on a rig to try and produce an effect that on a computer could be altered with a few hours in front of a screen. Time on set can be incredibly costly and there’s no way to totally eliminate the risk of failure when it comes time to shoot. But honestly, who among us wouldn’t chose to build the giant hydraulic arm that flings around cement trucks, if given the chance and a sufficiently large budget? It’s certainly a lot more fun than someone yelling, “Don’t worry, we’ll add that in post.” Not only that, but it gives opportunities to certain people that your casual film-goer probably doesn’t think about—set designers, carpenters, engineers, and other folks concerned with the often incredibly technically aspects of creating a shot. There’s also a lot to be said for authenticity. Not only is it likely easier for an actor to work with something they can actually touch and see (as opposed to waving their hands around and hoping they look cool), but it’s important for the overall creation of the film. A digitally added monster is essentially just an animated doll. But a real person, after hours of makeup, can provide the scares while also still moving, breathing, and registering as definitely alive to whatever part of our subconscious separates the real from the unreal. Similarly, the camera, which functions as our eye in the world of film, can move around a physical object much more effectively than a digital one. The person operating the camera during a scene that relies heavily on digital effect can only guess what the final product might look like, whereas a camera operator working with practical effects can watch it play out in front of them and know it looks good, straight out of the camera. The business of movie making is all about carefully constructing a reality, such as making a house look seamless when the kitchen location exists in an entirely different city than the bedroom location. There’s a lot to be said for practical effects and their ability to create this seamlessness, a feeling of really being among horrifying monsters, superheroes, or apocalyptic carnage. Digital effects can be unwatchably corny at their worst, but even at their best, it’s unlikely they’ll be replacing practical effects any time soon. Digital effects are best when used sparingly as a supplement to the real movie magic, transforming people just like you and I into monsters, aliens, gods, adventurers, villains, and everything in between.